I was originally going to make 2 reviews, but figured to just consolidate it down to this one. I guess I will LOOSELY compare the two against each other because they have a similar price point and are both non-leather/non racing everyday premium riding pants. 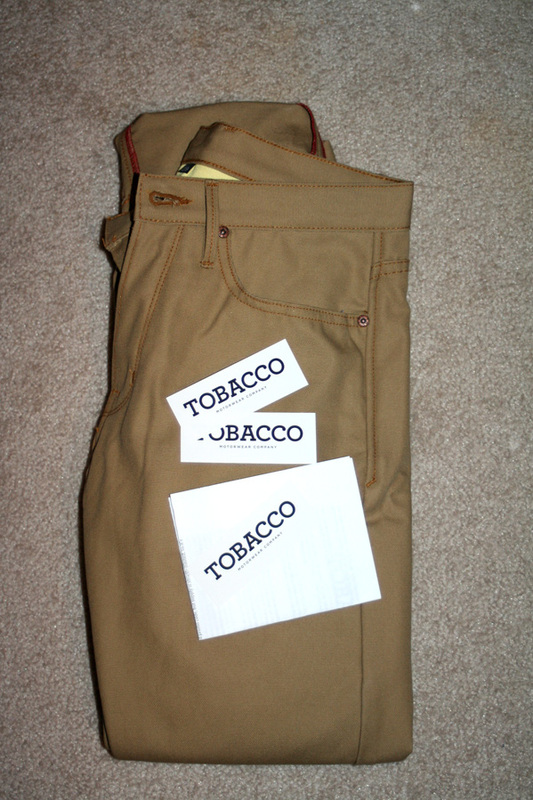 TOBACCO Motorwear Canvas riding pants. $288.00 +$10 shipping. I ordered a black pair (actually it was for Christmas but the wife told me to order it so she doesn't screw it up) but instead got the natural canvas (see Online Order quirks below). I really liked the way it looked with dark tops/jackets so I decided to keep them. They ship USPS priority right into a flat-rate box, so keep that in mind. Maybe down the line they will have better/secure shipping methods including better shipping packaging. These guys have been running for only 6 months after all. Inside the box was the pants and stickers/document in the pants pocket. Fit is relaxed and their sizing method youtube vid is spot-on, if you follow the vid you should get it right the first time. But the canvas is very stiff and requires hours of break-in. I've been wearing it for maybe 3 hours so far, still very stiff. Unfortunately its been raining so I can't break it in properly. Some cons, its very tight in the crotch area. Yeah. Its also very long, and guessing no matter how tall you are, you will get a long inseam as it seems like the norm with non-leather motorcycle pants so you can fold the cuffs. Well, you have no choice but to fold them or hem them. Also it is a button fly. Love those or hate those. I particularly do not like button flies. And, the contrast stitching on the canvas are red (which goes nicely with the red laces on my Stylmartins), so keep that in mind if you are super detail-style oriented. As you can see in the pic, these pair of pants look really normal, you can wear it anywhere you want and not look like you were wearing motorcycle pants. Yeah, I'm wearing their t-shirt because I got it as a freebie for them messing up my order. By the way, its a quality t-shirt. Super soft fabric. As far as the protection goes, I would consider this the minimum as far as protected pants goes. It has no armor. But I will admit, the front kevlar lining is extremely generous. With me having to fold the hems/cuffs, plus with boots, it pretty much covers the entire front of my leg. The back on the other hand is not as long as my 2Slub-K's. So, I guess I wouldn't recommend these for highway riding. Strictly city and casual scenic and hang-out riding. Take note that these guys are just starting out, they kickstartered the company last summer, so they have been operating for 6 months. With that you will find A LOT of hiccups. First of all, they don't say whether or not they have the product in stock, you can order everything whether they have it in or not. So if you are lucky, you will get a shipment notification in 1-3 days. If you are not, you may or may not get an email. But what happened was I ordered a black canvas, and they sent out regular canvas. I don't know if this was really an accident or intentional I say this because they guy who handles the online orders, Nate, is a great and personable guy who seems to really go in-depth with his emails. If I was a betting man, I'd say they are trying to fulfill their orders with alternates and hoping for the best, and one guy taxed with the duties of seeing if the gamble paid off. Now, this is all just conjecture on my part because any other place I've dealt with that screwed up my order will have a quick fix system with minimal customer interaction or short emails. Instead Nate emails me with a good list of things he can do to fix my predicament, almost like he does this a lot. He does a great job at it and he's really casual/friendly using informal words such as "dude" which really struck a chord with me into liking these guys. So all said and done, I got a free 25 dollar t-shirt, and I even ordered another pair of pants from them because Nate is top-notch as far as email based customer service goes. But alas, after I ordered the second pair (this time in their black jeans), I get another email from him saying they are out of stock and he asked me if I wanted to cancel the order or wait for them to come in. I'm waiting this time for the black. I am very happy with these pants as far as initial thoughts go. I will still have to log in the miles with them. The company itself, they still have to work out the kinks and their reliability as far as ordering goes is iffy, but thanks to the face of their customer service, I'm happy to stick with them and see how well they grow. EDIT: POST BREAK IN NOTES AND OBSERVATIONS. So I've used the pants a whole bunch of times now. Off the motorcycle it fits fine, but I notice on the motorcycle in the riding position it is constricting at the upper waist against your belly. You either have to get one size up or not button the upper button fly (which is what I've been doing). This is after the material has softened up. I wear this pants regularly even when not riding (sort of doing this to speed up break-in) I seem to like wearing it more as regular pants instead of riding pants but that might be due to what I mention above about it being constricting. 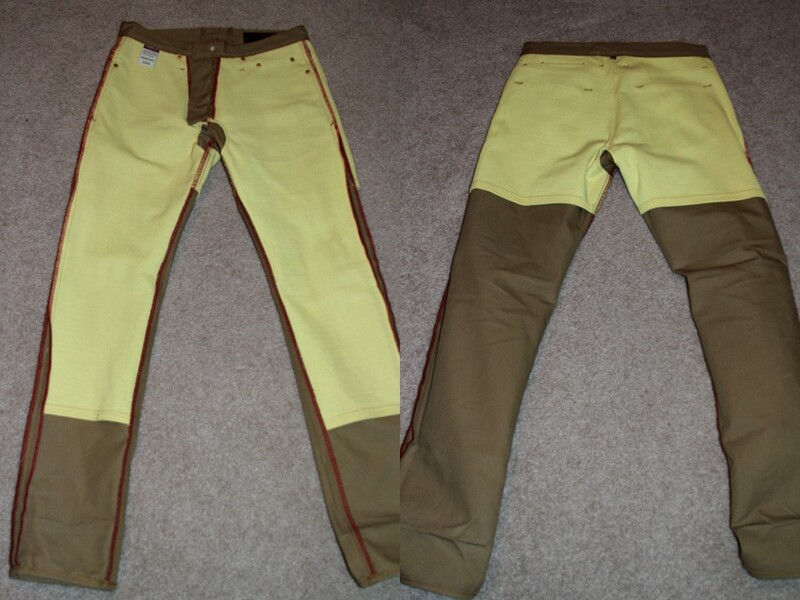 I also bought myself some SIDI riding shoes to go along with these pants, and its odd I use both a lot when not riding. UGLYBROS 2Slub-K riding pants. $349.00 plus $10 shipping. Youch! These are actually my very first pants I bought, and I've been using them exclusively for 16 months. Haven't washed them yet because I'm treating them like premium jeans. Yes, the price is very steep. But for my body type I think they were worth it. First thing's first. They are an established online retailer, so you won't get any surprises ordering from them. If they don't have it in stock, the website will tell you. You get a shipment notification probably the same day or the next day. They ship UPS in a rather big box with nice protection inside. For 350 bucks, its to be expected! 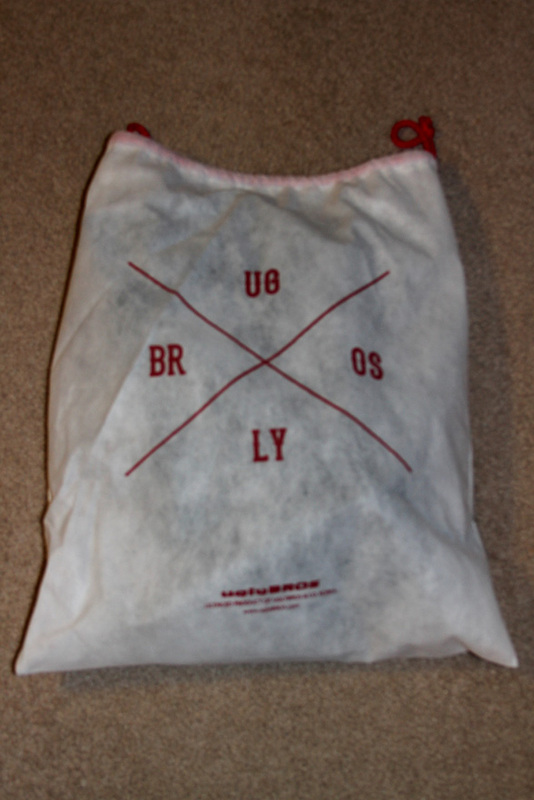 As a nice bonus the pants come with its very own carrying bag! Fit is great, I had no problems deciphering their sizing chart. These are skinny jeans so be aware of that fact. These jeans are super comfortable as far as the feel goes. It has that stretchy-jeans quality, and its soft and supple. Very nice premium jean feel if you've ever bought a hundred+ dollar jeans. Once again the inseam will be long so it either has to be hemmed or folded. It has elastic shirring on the knees so bending with this feel great. 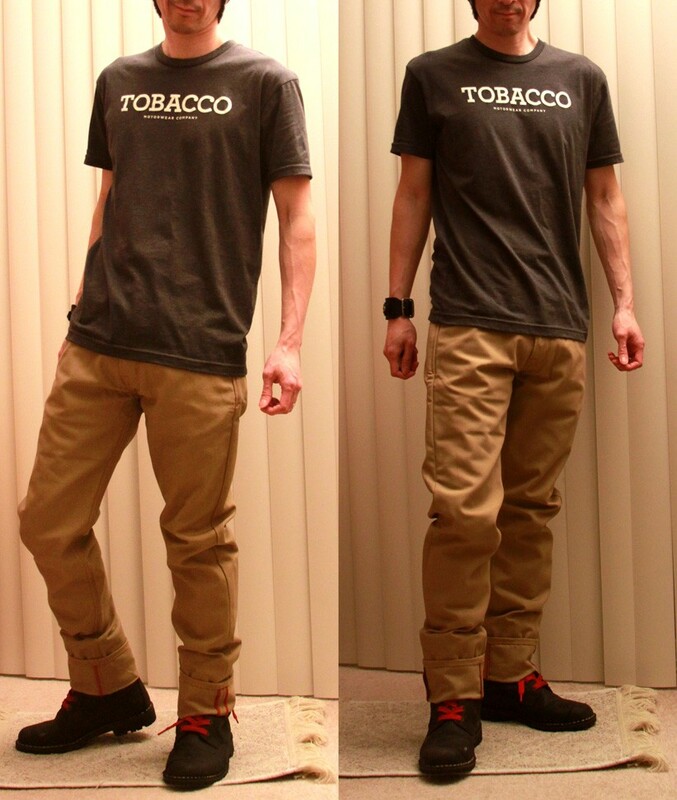 Aesthetically, it does have that non-standard look going on, plus with the hip armors in place, you will have hips wearing these as you can see in the picture (compare it against the Tobacco canvas, I have hips with these due to the armor). Also the one back pocket is a zipper pocket so that's a nice touch, you can put some stuff in there without worrying about it flying out while riding. Yeah, I'm lazy, I'm wearing the same shirt. I took these pics right after the other one. Something particular to note about this pic below: These jeans have removable knee pads, and obviously they have to be usable by a broad range of heights and inseams. 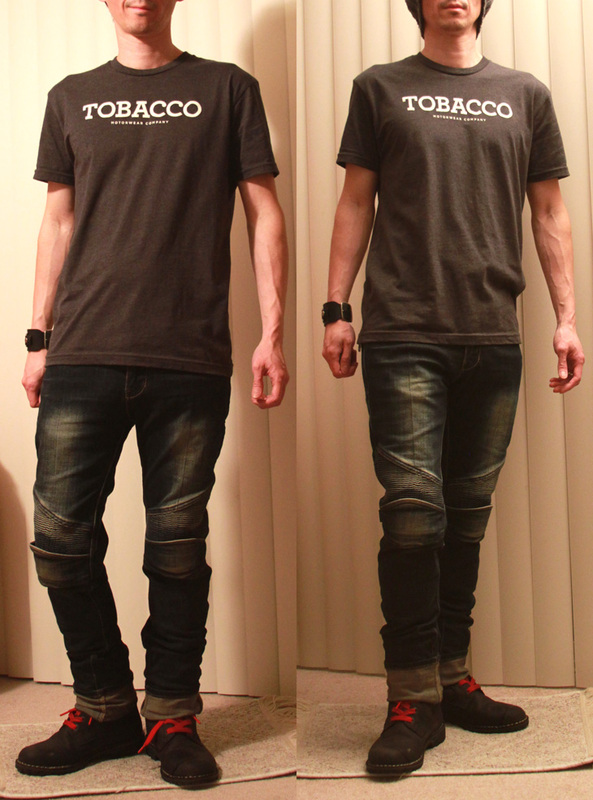 The pic on the left shows what the jeans look like when I just instantly slip it on. The knee pad area is slightly below my knee (they aren't inserted). 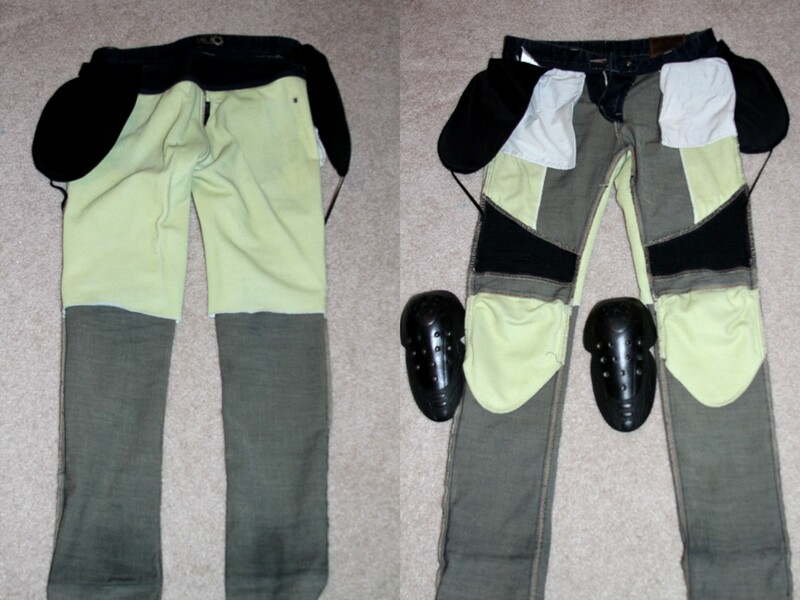 But when you insert the knee pads and adjust them to your size, that is the pic on the right. As far as protection goes. The kevlar lining in the back is longer than the Tobacco, so more protection there. The front, there is a compromise to make room for the comfort of the elastic shirring. But imo the hip and the knee armors make up for this as they are quite raised. The hip armor placement is on the side if you are wondering. Plus it can be removed. As can the knee armor as you can see in the pic. I've been using these pair for over a year and the quality is great. I can't say for sure unless I drop my bike but I would guess these will offer slightly more protection than the Tobaccos, and especially the knee pads will save some impact damage on your knees. These are still casual type riding pants, maybe scenic twistys based on the amount of protection it has. Uglybros' ad campaign/slogan states that "We're not racers, but riders" so keep that in mind for the use of these pants. Although I've taken them on the highway for about 1000 miles. I wouldn't recommend riding them on the highway though, I still have to get myself some textile or leathers for that. I can tell the heft of the price is coming from the premium quality soft feel of the jeans as well as the removable armors plus the fact that is probably one of the only jeans out there that offer skinny jeans and sizing for smaller riders (although sizes go up to over 6'), imo makes these worth it, and I will still be using these pair most of the time for a long time. If skinny jeans are not your thing, definitely do not spend the cash on these as they are not worth it. You're mostly paying for the style.